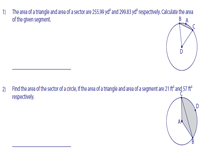 The circle worksheets in this page cover the area of the segment and its relation between area of the sector and area of the triangle in detail, and the worksheets are further classified accordingly. It enables to find the area of segment, area of the triangle and area of the sector, if any one among of the parameters are given; the area of the segment by calculating the unknown values as represented on the diagram and much more. 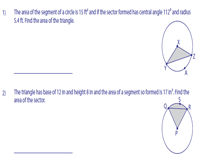 This section comprises of problems to find the area of the segment,area of the triangle and the area of the sector directly from the diagram, if any two of the parameters are provided. Round the answers to two decimal places. 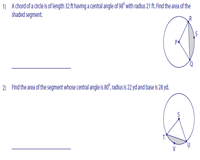 Find the area of the segment by identifying the values of central angle θ, radius of the circle (r), base (b) and height (h) of the triangle from the diagram. Each worksheet has five problems. 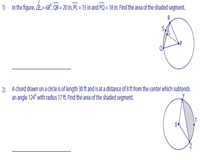 This section has worksheets on finding the area of the shaded segment using the appropriate parameters. Student should find the value of the required parameter in first-hand using the information provided in the diagram. Round the answers to two decimal places.